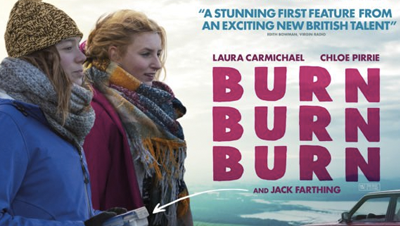 ‘Burn, Burn, Burn’ is one of many brilliant indie films that I’ve had the pleasure of watching this year. Directed by Chanya Button it stars both Chloe Pirrie and Laura Carmichael – I’m seeing these two a lot these days in various different film and TV appearances, and as always the acting is fantastic. Ally (Pirrie) and Seph (Carmichael) have recently endured the death of their 29 year old best friend Dan (Jack Farthing). He hadn’t told them that he was dying of cancer and so his death came as a surprise. Just before they leave his funeral his step-dad shows them a video that Dan made for the girls before he died, asking them to scatter his ashes (secured in a Tupperware box) at four different locations for reasons unbeknown to them. After a series of unfortunate events that evening and the next day the two decide to go ahead with the plan, and set off on a road trip that becomes less about Dan and more about their own lives as they find themselves facing a whole set of painful issues against their will. As mentioned already the acting by both Pirrie and Carmichael is great, but Farthing is also brilliant as Dan, who features rather a lot for a newly-dead person. The whole story is very character-driven, and there are some great minor characters to keep it from becoming too repetitive, such as Ingrid (Sally Phillips), Seph’s overly-spiritual boss for her nanny job, and the mystical character Adam (Julian Rhind-Tutt) whose long ramblings seem inspiring until you’ve sobered up a bit. Something that really struck me about ‘Burn, Burn, Burn’ was just how well the emotional side of it came across – you’re expecting perhaps a slight welling of the eyes from the general idea of two people coming to terms with their friend’s death while scattering his ashes, but there’s so much more packed into it that by the end it’s become a full-blown sobfest (I’ll admit I didn’t just sob at this one – I bawled). Some of the scenes, particularly during the second half, are difficult to watch as we see Dan deteriorate and the two girls make future-changing decisions, yet despite the tear-jerker that it is the comedy is still spot-on at all points. It’s a nice balance really, and it stops it from being overly depressing. The film had to be a bit depressing though to get such a poignant message across so well - instead of complaining about our lives and letting it get on top of us, we should just go ahead and live it. We can all relate to making this mistake more than we intend to (maybe some of us haven’t realised yet that we’re doing it) and so maybe that’s why the emotion portrayed is just so affecting. It’s also down to the wonderful acting and composition of the story, of course, yet this message stayed with me long after the film had finished and really got me thinking about certain aspects of my life. Don’t let the potential for a life-changing epiphany put you off though – although it’s a bit heavy at points it’s got a captivating story and a bunch of characters that you just can’t help but feel for. A rollercoaster of a ride, but one that everyone should make time for.